I find Christianity to be a transformational practice like Hinduism/Buddhism and Taoism are perceived to be; the practice intent is to become. 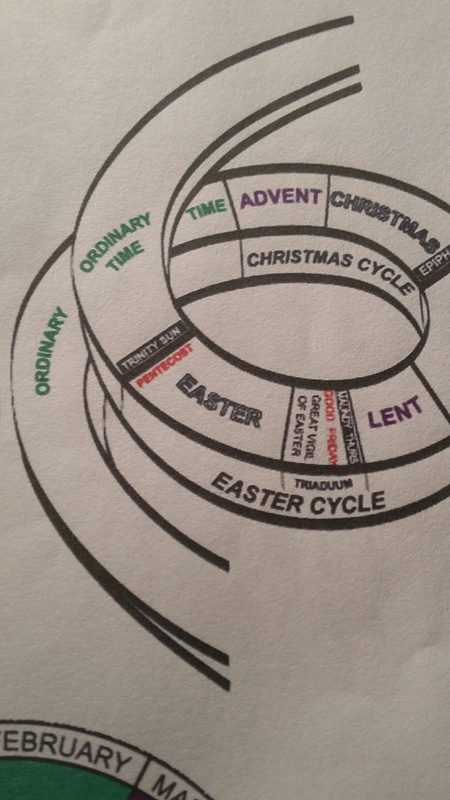 · The teaching cycles are Advent and Christmas (40 days) and Lent and Easter (~90 days). · We call the practice cycles ordinary time: Epiphany (eight weeks) and Pentecost (twenty eight weeks). · The Christmas cycle we learn joyful wait (Advent) and a glimpse to the joy to follow – of which we are invited to partake: the first and the second coming of Christ, a new and peaceful life. Christmas is a twelve presentation of God’s invitation, so to speak. · The twelve days ends with the Epiphany Feast, on January 6. · Ash Wednesday, the first day of Lent begins the Easter Cycle. · We learn about repentance and we practice discipline for forty days and then we are trust in to the death and resurrection that offer eternal Life, the crucifixion and resurrection narrative. · We learn and we wait until Pentecost. 4. The practice time we call Ordinary Time: Epiphany Season and Pentecost Season. · Epiphany is from January 7th until Ash Wednesday, some eight weeks later. o We wonder, during this time,” Do we accept the invitation presented at Christmas? o After all, repentance is no day at the beach or walk in the park, and for the most part it is not convenient. o I liken this practice time of examine as a practice in faith. · Pentecost starts with Trinity Sunday, sometime in late May or early June time frame. o I personally find this twenty six week period a good time to develop a new appreciation for the “Trinity” Concept – what it has to do with the way I live my life, how I do my walk, how I deal. o At the end of the twenty six week we start the first learning cycle again, perhaps with more insight than the last time; it is Advent. 5. The Lectionary, Daily Office Scripture reading and Psalms facilitate our contemplation, meditation and reflection as we go through these seasons.
. We do them in accordance with the Liturgical Season.
. Contemplation, meditation and reflection is what transforms us. 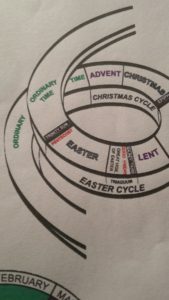 So, here you have it, my opinionated perception of the Liturgical Calendar. If you are interested, don’t just take my word. Discuss it with a Priest or Clerical leader that prays and preaches the seasons in their respective liturgical churches. They will help you. They might even help you find a suitable liturgical church community near you.